MAC It's A Strike Eyeshadows (Limited Edition) - Each eyeshadow retails $16 and contains 1.5g/0.05oz of product. They're also very easy to depot and can be stored in an empty palette, such as the 12 Piece Interchangeable Palette, which can be purchased from Coastal Scents for $5.95. 300 Game is a blackened cherry with a matte finish. 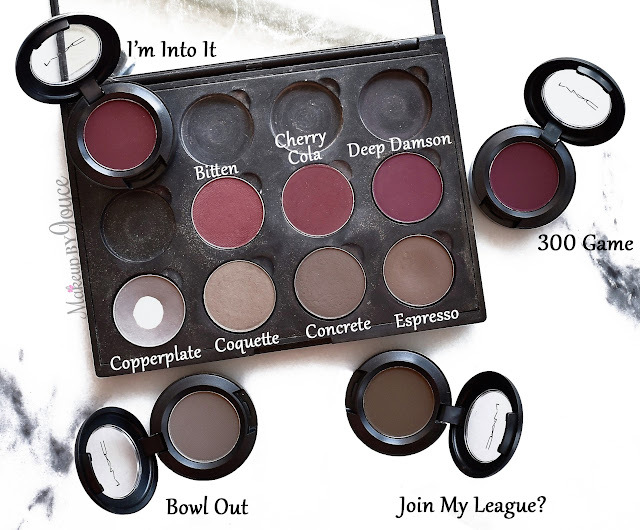 Mac's I'm Into It and Makeup Geek's Cherry Cola are more of a reddish brown. I'm Into It and Cherry Cola look very similar to one another, except I'm Into It is slightly darker than Cherry Cola and looks more brown when heavily swatched. Deep Damson looks alot like 300 Game as both colors are more of a purplish burgundy. The only difference is that Deep Damson is slightly lighter, but when applied onto the eyes, they look essentially the same. Makeup Geek's Bitten is lighter, not as matte and pulls more red compared to 300 Game. I use all of these shades the same way and as a pop of color in my crease when I want to spice up a neutral eye look. Bowl Out is a midtone grey with a matte finish. It's not as light & grey as Copperplate and not as dark & brown as Join My League? and Concrete (review). Also, Coquette is definitely not a dupe as it looks more like a khaki shade compared to Bowl Out. Join My League? is a dark espresso with a matte finish. It's not as warm as Espresso and looks most similar to Concrete, except Concrete is slightly lighter and pulls more grey. When blended into the crease, they look practically the same. I use Bowl Out, Join My League?, Coquette, Concrete and Espresso interchangeably. They are all great shades for defining the crease and creating depth. Formula & Longevity: MAC's eyeshadows are (1) very pigmented, (2) apply smoothly, (3) layer well and (4) blend easily. For packing color onto my crease, I love using my Japonesque #232 because it lays down product exactly where I want it to and with intensity too. For blending harsh lines, a dense brush made of natural bristles, such as the Sonia Kashuk #116, is a must-have because it does all the work for you! I have never had any issues with the pigmentation and blendability of MAC eyeshadows. If you are struggling with eyeshadow application, I highly recommend checking out the brushes that I've just mentioned. As for longevity, MAC's eyeshadows last at least 14 hours without creasing when worn with a primer, such as the Urban Decay Primer Potion. For reference, I have oily lids and always pair eyeshadows with a primer. Many other brands have eyeshadows that are very pigmented, but I experience alot of fallouts with those and I hit pan alot faster. One of the reasons why I keep repurchasing from MAC is because of the formula. I barely experience any fallouts during application with MAC eyeshadows and a little goes a long way. Note: The MAC eyeshadows are available at Nordstrom, Saks and Bloomingdale's. The Makeup Geek eyeshadows are available on their online store and Beauty Bay. This post contains affiliate links. None of the products mentioned are sponsored.